RUNNING FOR THE WIN – Fieldcrest’s four by eight relay of from left to right Andrew Gochanour, Andy Wiesenhofer, Christian Skaggs and Ryan Gochanour placed first in the Rollie Morris Invitational on Saturday at Spring Valley Hall (For the Journal/Carol Bauer). 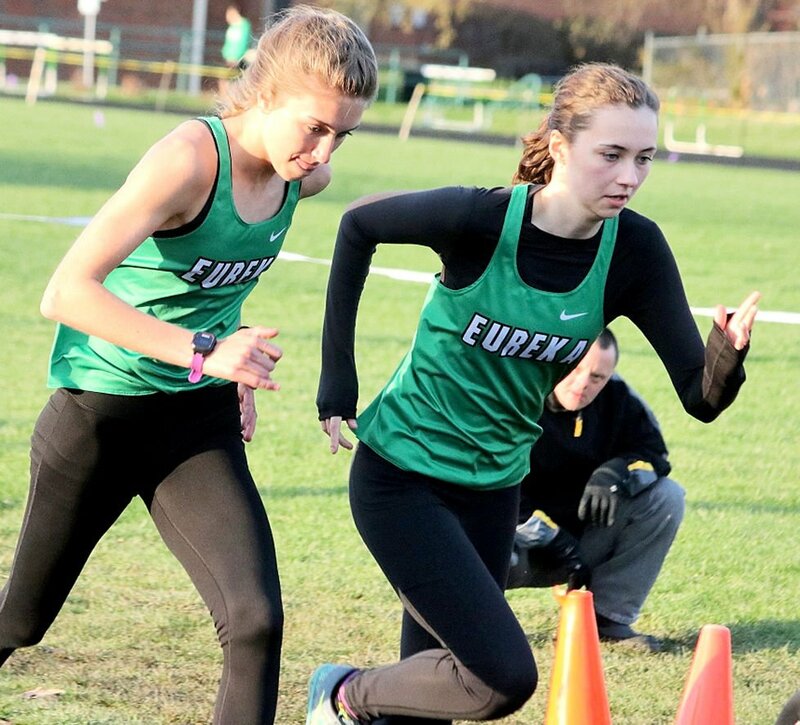 GOING FOR FIRST – Eureka runners Anna Perry (left) and Nora Robinson (right) compete in the 1,600 during Monday’s home quad. Perry ended up in first (For the Journal/Robyn Wiegand). BLAZING A TRAIL – Jack Cook of Eureka competes in the 1,600 on Monday. When the race concluded, Cook came out on top (For the Journal/Robyn Wiegand). Peoria Christian 6, Roanoke-Benson/Lowpoint-Washburn 7 (11): Jake Weber rapped out three hits, while Jarrett Bline scored the winning run for RBLW (6-7, 4-2) in the Tri-County Conference game that began Tuesday at R-B and finished up Thursday at Woodruff Field. RBLW 7, Peoria Ch. 0: In Thursday's scheduled league matchup, Jack Weber fired six scoreless frames on the mound. Fieldcrest 5, Deer Creek-Mackinaw 0: Koy Allen twirled a three-hit shutout and the mound and managed three hits with his bat for the Knights (7-3, 3-1) in Friday's Heart of Illinois Conference road game. Eureka 27, Ridgeview 4 (5): The Hornets (14-3, 5-0) sprayed around 25 hits in the league game on Friday. Aaron Schwab provided four hits, which produced five runs batted in. The 10-run rule went into effect after five innings. Fieldcrest 22, Serena 1 (5): Fieldcrest matched its run total with hits on Saturday, as Andrew Perry led with four. The game was called after five by the 10-run rule. RBLW 4, Le Roy 14 (5): Blake Martin picked up two hits for the Monday guests. The contest was halted in the fifth by the 10-run rule. DCM 1, Eureka 5: Brady Krile struck out 10 and allowed just three hits to the HOIC visitors on Tuesday. The game was moved back from Monday because of unsatisfactory diamond conditions. Midland 12, RBLW 16: Ben Monge's three hits and five RBIs powered the Rockets in the TCC contest on Tuesday. The location was shifted from rural Varna southeast to R-B due to better field conditions. Fieldcrest 15, DCM 3 (5): Addie Goodrich's three hits guided Fieldcrest (6-4, 2-1) in HOIC action on Friday. The game ended after five because of the 10-run rule. Putnam County 6, Eureka 9: Marah Miller provided three hits and three RBIs for the Hornets (7-6), who saw the Saturday guest score all of their runs in the top of the first. Fieldcrest 2-7, Serena 0-5: Alaina Tjaden weaved a two-hitter in game one of a Saturday twinbill for the guests, while Aliyah Fuchs contributed three hits in the nightcap. Leman goes two for two: Whitney Leman of LWRB won the long and triple jumps during Thursday's Tri-Valley Invitational that was held at Le Roy. 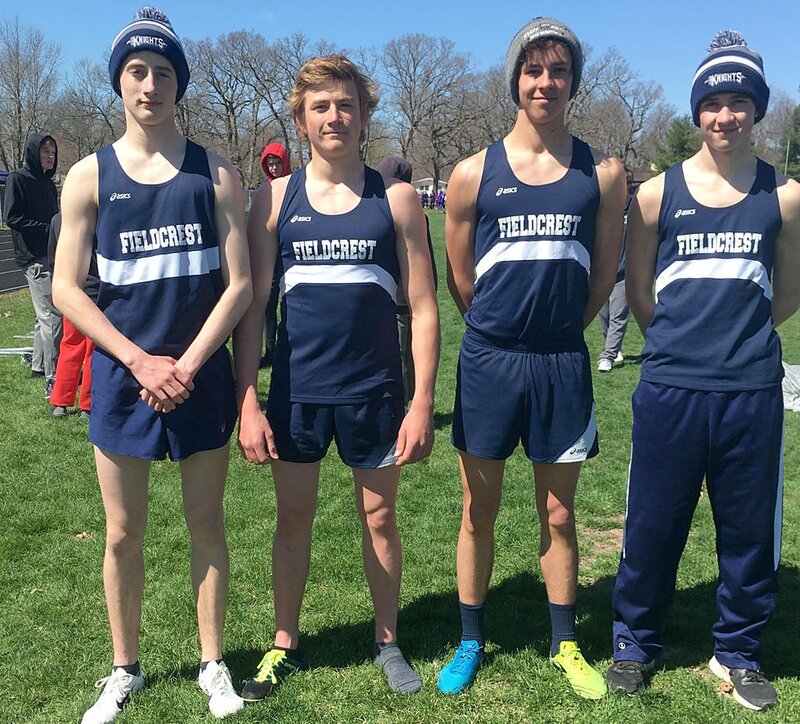 Relay takes first: Fieldcrest's four by eight of Ryan Gochanour, Christian Skaggs, Andy Wiesenhofer and Andrew Gochanour reached the finish line in first place during the Rollie Morris Invitational on Saturday at Spring Valley Hall. Eureka sweeps: The host Hornets received wins from Amy Pineda (100) and Kyle Johnson (3200) in a co-ed quad on Monday that included LWRB, Princeville and Tremont. Co-op reigns in field event: Logan Gastman and Madalyn Oltman each won the high jump for LWRB in a hextangular meet Tuesday at Seneca.